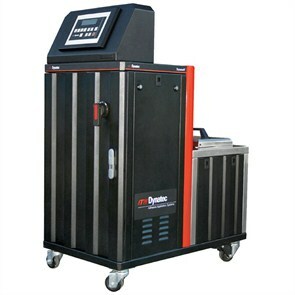 The Dynamelt D Series features ITW Dynatec's patented no-char, Melt-On-Demand System. Dynamelt D Series is available in four hopper sizes and with a choice of dual or single gear pumps. The ASU uses a microprocessor temperature control to closely control the temperature of hot melt adhesive for up to eight hose standard and precision metered outputs. Up to four drives / four gear pumps permit up to 8 metered outputs. Standard or precision metered outputs are available. User-friendly push icon-driven controls with multi-lingual display. Dynacontrol™ P.I.D. digital temperature controller with platinum sensor accuracy. 9 combinations of hopper sizes and melt rate selections.